The F# is used for identification purposes, and is usually placed on a firefighter’s personal protective equipment. This system originated under Chief William Comer who was assigned as F1. Below is a list of the initial numbers - of Chief's roster. 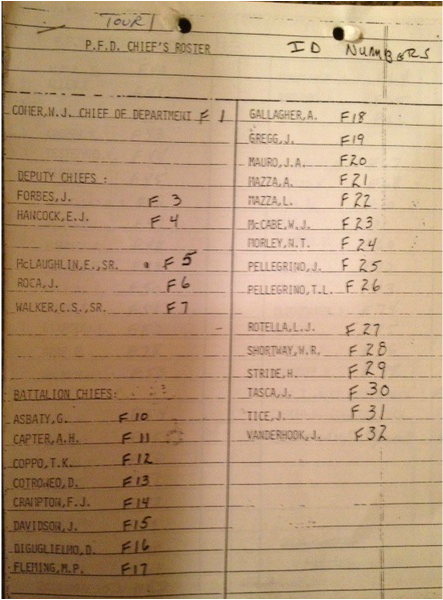 It appears the F#s were given out in alphabetical order by rank not according to seniority as Deputy Chiefs Hancock (1954) and Walker (1956) appointments preceded DC Forbes (1960). Previous F numbers could be reused but presently each firefighter is issued a badge number and a unique F#. Current PFD records us an "F000" system and list Chief John Mauro as F001. Since the original F#s appeared in a rank order, it is likely that Mauro "took over" the F1 or F001 when Comer retired. ​At the turn of the 20th century the department began assigning F#s based upon a firefighters appointment date and thus they are currently in seniority order. They are never used again, even after a member retires. Badge numbers and F numbers are not related.